I know, I know, it seems like an eternity since the cycling season ended (wasn’t it only last week…?). Well, fret not dear reader, it’s back! 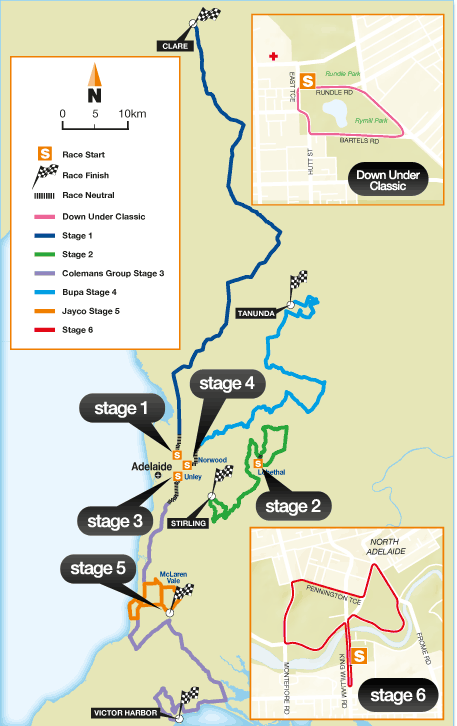 The Tour Down Under will run its 12th edition, in the hills surrounding Adelaide, starting this Sunday. All the big teams will be there, with even a few big names, including Valverde, Casar, Sanchez, Jens, Pettachi, Thomas and Hesjedal. Notably missing is just about anyone shooting for a Tour de France win, including Aussie Cadel Evans. The team to watch, I suppose, will be GreenEDGE, an all-Australian team that will have its inaugural run in its own country. No pressure at all. I’m not sure about live coverage yet, but Steephill.tv will have the goods on that soon, I’d imagine. This entry was posted in Cycling and tagged tour down under 2012 route map. Bookmark the permalink. I was in McLaren Vale this time last year. Got a Tour Down Under cap I ‘m happy to swap ! Either you beat me or I beat you because I was there this time of year 16 years ago. Love to go back but it’s getting farther and farther away..